Imagine if you spotted a UFO or had a run-in with an extraterrestrial. Would you tell anyone what happened, or would you keep your mouth shut so nobody called you crazy in the head? I bet that gets you thinking about Reece’s Pieces. So, do aliens love Wisconsin, or do Wisconsinites perhaps drink a little bit too much? UFOWisconsin.com claims around 20% of all UFO sightings are valid. And in Wisconsin, there are plenty of professional paranormal investigators who research each case. Lewis has been featured on hundreds of radio interviews, TV shows and in newspaper articles. Last year, he made a visit to the Spooner Library to talk about UFOs in Wisconsin. The Up Norther Explorer captured some things he had to say about visitors from space stopping in our state. “I’ve spent the past 20 years traveling the world looking for the strange and unusual, and some of the strangest UFO sightings I’ve found have been right here in Wisconsin…. You can find many of Chad’s adventures in his book, The Wisconsin Road Guide to Mysterious Creatures. So – will you scoff at these people’s stories, or will you be open to the possibility that creatures from outer-space are visiting our planet? Decide for yourself – after you read these seven bizarre UFO stories from people in Wisconsin. One morning back in 1961, Joe Simonton – a 60 year old Wisconsin chicken farmer living in Eagle River, heard some strange noises outside his house. He stepped outside to discover a very bright silver disk floating above his yard. It was about 12 feet from top to bottom and 30 feet in diameter. Simonton says he saw the hatch open, and three dark-skinned “Italian-looking” men about 5-feet tall and 125 pounds were standing inside holding a chrome thermos. They were dressed in tight black and blue suits and wore helmets. He noticed they were making something on a cooking device that looked like a griddle. They didn’t speak, but somehow Joe knew the men needed water, and he offered to fill up their jug with his pump. When he got back to the apparent spacecraft, he handed over the water. In return, one of the aliens handed him four thin, holey pancakes. The head alien put his finger on his forehead as if to say, “thank you.” Simonton saluted him back. I think it’s hilarious that he tasted it! Would you? Lewis says the “saucer cakes” were analyzed and determined to be made of flour, sugar and grease. “Some believe the ‘real’ findings were classified and hushed up.” Lewis said. The U.S. Airforce did some major investigations on the case and in the end decided it must have been “a sudden strange dream Simonton had while he was still awake.” Wait… isn’t that just a daydream? Simonton was a fairly normal guy. He was well-liked in the community, and even played the annual Santa Claus for the Eagle River Chamber. But that wasn’t enough to make anyone believe him. Chad Lewis version of the story available from the Up Norther Explorer. About half of all alien encounters reported in the U.S. describe “The Greys.” Lewis says they might be the most familiar extraterrestrial beings. The Greys are famous for the Roswell UFO incident from 1947, as well as the Barney and Betty Hill Abduction from 1961. But, Wisconsin has an even more recent report of a “Greys” abduction that happened in Bloomer in 1997. One day, a woman from Bloomer, Wisconsin – who didn’t want to give her name – saw a craft hovering by her home. Her front door opened, she felt a slow, steady force and a mist oozed in. “She could hear a voice in her mind asking her why she was resisting.” Lewis tells us. He was part of the group who interviewed her under hypnosis. Something Chad Lewis found alarming, was that she recalled seeing at least a dozen other people on board the alien craft with her. He wonders what happened to them! During the hypnosis session, Lewis found out that this was not the first close encounter this women. Strange things like this started happening to her at least 20 years earlier. The poor women even started to cry while she was hypnotized. Read more on this case from the Up Norther Explorer. What if a police officer told you he saw a UFO? Would you believe someone like that? In 1976, 30-year veteran police officer and World War II combat pilot George Wheeler said he saw a UFO near his home in Elmwood, Wisconsin. It was the second time Wheeler had seen something strange in the skies above the area. The officer spotted what looked like a very bright orange glow coming from the top of Tuttle Hill. He said it was as bright as the sun and hard to look at. At first Wheeler assumed it was a fire, so he drove his squad car to the top of the hill. To his surprise, he found a glowing object that seemed to be hovering 100 -feet off the ground. It had six bluish-white lights, windows on the sides and he could see moving shadows inside. That’s when Wheeler radioed the sheriff’s department in Ellsworth to tell them he was watching a UFO. Just then, the spacecraft quickly shot straight up into the sky making a whooshing sound as it left. Wheeler claims a flash of light came down from the ship and struck him. At that point, the squad car’s lights and radio went completely dead. Wheeler was barely conscious. He couldn’t remember what happened after that until local resident, David Moots, stopped to ask him if he was okay. Elmwood is actually a hotspot for UFO sightings. Moots said he’d heard of a lot of people making such claims, so it was no particular surprise. But being “hit” by a UFO took him back a bit. There were several other witnesses involved and interviewed in this case. This wasn’t the first time Mr. Fredrickson spotted something like this. Only six months earlier, he and his son saw a very similar object in the sky about the exact same time and place. Nearby, at the O’Bryan family farm, Mr. O’Bryan said his TV set quit for a short time while he was watching the Perry Mason show – right about the same time it all went down. A 9-year-old boy at another nearby farm said his dogs were barking and acting unusually weird that night. That’s when Helmer left right away to see what was up. When he got to the top of the hill, he found Moots trying to calm Wheeler down. Helmer said he’d never seen a man as frightened and upset as Wheeler was. The officer also pointed out that the patrol car, which recently had a tune up, needed all of its points and plugs replaced in the engine and the starter was also acting up. At about 1AM, or 2 hours after the incident, Mrs. Wheeler had to take her husband to the hospital. He was there for three days and tests found nothing, so he was released. Only a few days later he returned because he was having severe headaches and nightmares. He could also no longer remember any of the details from the sighting. He was driving slowly on his way home from a meeting that night when he spotted a strange object on the side of the road. He slowly drove closer to it trying to see through the fog. But his headlights were so bright that he could only make out the top half of the object. The “human” as Bosak told newspapers, was standing still inside a transparent glass compartment that was bullet-shaped and tapered toward the top. It was between eight and 10 feet tall and had its arms raised above its head. The creature was wearing a skin-tight suit and had dark tan fur sticking out from the sides of its head. It also had a furry upper body and hairy pits. Its ears stuck out about three inches from his head. As Bosak got close, fear overcame him and he decided to get the H outta dodge. When he stepped on the accelerator, the inside of his car got dark and he heard a noise like the engine was missing. He also heard a soft whooshing sound like tree branches rubbing up against a car. Field Investigator, Everett E. Lightner, who was on the case reported that Bosak was very frightened at the time, but the look on the aliens face looked as scared as he was. He could tell by its large eyes protruding from his head. “I was so goldarned scared I was afraid to go out at night for a few days,” Bosak told reporters. Bosak actually kept his encounter a secret for almost a month. He didn’t even tell his own family. He said prior to his experience, he was skeptical of UFO stories. Anne and Peter E. of Wauwatosa, Wisconsin reported their close encounter in November of 1975. They were an older couple. Pete was 64 and was a retired foreman who worked at a local construction company for more than 30 years. Anne was 59, and said she wouldn’t believe this kind of story if she hadn’t witnessed it herself. The doorbell rang at 7:50 one night, and Anne looked behind the curtain to see who was there. She saw a strangely dressed man holding a white staff of some kind. After repeating herself, she realized the man didn’t talk. That’s when she called Pete to come to the door. He unlocked and opened the door to get a better look. “The skin on his face was the same as smoked meat and the face was lined with deep grooves,” Pete reported later. Pete also described the strange man as having a small puckered opening for his mouth the size of a dime and a pointy chin. The human-like creature also wore a hat – similar to a straw hat – but with a narrow brim. And he had tufts of hair sticking out from both sides. “They looked like over-sized gnomes,” Pete said. At first, Pete really thought it was a prank. So he reached out to grab the man, but when he did the creature raised his white staff and smacked the sidewalk with it making him float backwards. “He didn’t step back or jump back, he just drifted away from me,” Pete explained. He looked out toward the street and saw four similar looking beings on the lawn and in the road. He could see they looked deformed with arthritic claws and legs that were bent and bowed. “One of them was heavier than the rest. Pete went on. He was out in the middle of the street. He was rapping his staff on the asphalt and floating two to three feet above the ground each time it clicked. Pete called the Wauwatosa Police Department that night. As it turned out, Officer Daniel Anderson had just gotten a similar radio message about strange looking people only a couple blocks away. The police supposedly surveyed the area for three days and found nothing. The couple said they felt like Officer Anderson thought that they were a couple of nuts, which is very possible, because the officer never filed a report about the incident. Anne and Pete are convinced they were visited by spacemen that night. But, they did take a lot of crap from friends and family. “My own son walks hunchbacked and says click-click just to kid us,” Pete reported. The couple later found out one of their neighbors had seen a strange vehicle in the sky driving through the Menominee River Parkway. They kept quiet so nobody made fun of them. Peter said that they were probably right to do so. I’m not sure how this story is about visitors from space – but it is certainly strange! Way back in 1919, a 13 year-old boy named Harry Anderson was along for a drive with family and friends in their new Model-T Ford. The group was on its way back to Eau Claire when the car’s engine started to act up. Harry’s father determined they were running low on oil and asked his son to run to a nearby farm and see if he could get some. Harry cut through a cornfield towards a farmhouse in Barron, Wisconsin where he found help. But on his way back through the field with the oil – he claims he encountered something quite curious. 20 little men were marching towards him in a single file line! Harry described them as having bald heads, white skin and wearing leather ‘knee-pants’ held up by braces over their shoulders. A lot like the German Lederhosen pictured to the left. Remember – this is 1919 – 18 years before Disney’s Snow White and the Seven Dwarfs was released. Apparently these beings knew English. And, according to their song, whatever war they were singing about would have ended 20 years ago. Hope things turned out alright for them. This story blows my mind! You can find it published on The Galaxy Gazette as well as W-files.com. Sociology professor, John Salter Jr., tells us about his very close encounter with, what he calls, “friendly aliens” in 1988. They say they were in La Crosse, Wisconsin when the abduction happened. Salter says amnesia engulfed both of them, and doesn’t remember exactly how he and his son were abducted. They were still conscious, and somehow they were “gently but firmly forced off the highway onto a very narrow and extremely rough road,” Salter explained. That’s when they saw two or three “small humanoid figures” climbing up on the back bumper of Salter’s Ford pickup. He described them as being 4 to 4-and-a-half feet tall with large heads and large “quasi-slanted eyes.” He said the beings were pleasant and he could tell they didn’t intend to harm anyone. According to the professor there were six or seven small aliens and one taller humanoid who was about the same size as a typical human man. The taller one seemed to be the leader. “His features are more, as we would use the term, ‘human’–and he may well be a mixed-blood.” Salter said. The aliens took the two men through the woods, up a ravine and over a ridge and inside a vessel that was in a large clearing. Salter and his son remember a bright room with white lights and a blue glowing panel. “An implant is placed very carefully up into my right nostril and well beyond.” Salter recalled. “There is now an injection into my neck, at the thyroid area; and then an injection into my upper, central chest.” He added. Salter estimated the encounter lasted about an hour and a half. But despite what you’d expect, this was not a horrifying experience. The aliens and humans were even sad when it was time to part ways. Salter and the tall humanoid telepathically tell each other they’ll see one another again in another place in another time. The leader walks them back to their pickup truck and the father and son watch the UFO, brightly lit, fly diagonally up through the darkened clouds and beyond. First off, Salter and his son didn’t recall anything that happened to them until months afterwards. He says they had some sort of amnesia. Then all of a sudden most everything came back to them and the two stories meshed. Salter claims that more than a dozen physiological changes have happened to him since the event. All good things. He believes they are most likely from the implant and injections given to him that day. His head hair, fingernails, and toenails grow two to three times their normal rate. Eyebrows got very thick and fine body hair grew all over his almost hairless arms, legs, stomach and chest. Cuts and scratches clot immediately and heal very, very rapidly. For the first time in his life, his beard is very heavy, thick and dark. A denture placed in 1984 resulted in almost daily blood for four year until shortly after the encounter. Some little age spots have shrunk or disappeared and the few wrinkles in his face faded away. His skin tone is much clearer. Blood is much closer to the surface all over his body with better circulation than before. His immunity is stronger – the few colds he may get are very short-lived. His energy level is up and his sleep needs are down. His protein needs are very heavy. Disfigurement on his face from a car accident faded completely. He has frequent “telekinetic episodes” – especially around electrical equipment. He has a mild aversion to sunlight and increased sensitivity to lights. Occasionally, a red welt appears on his neck, and a brown, circular spot on his upper chest. Salter’s son stopped growing 4 years before the abduction, but grew 1.5 inches taller that spring. You can find many more fascinating details from Salter’s story on W-files.com. As I mentioned at the beginning of the article, three cities in Wisconsin lay claim to the title UFO Capital of the World. They are Dundee a community in in the town of Osceola, in Fond du Lac County, Elmwood on the west side of the state in Pierce County, and Belleville, which is south of Madison in Dane County. An article from Mentalfloss.com says the three towns have been arguing for decades about who is ultimately the true UFO capital. 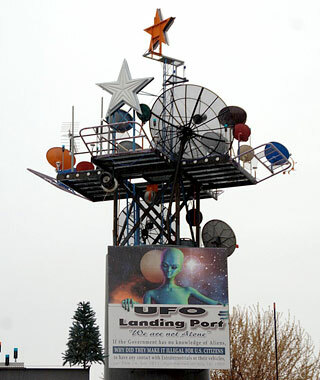 All three of the towns host UFO-themed events every year. But all that is a story for another day! Watch for a follow up in the near future. Let’s Hear Your Strange Stories! There are many other stories of close encounters in Wisconsin we left off this list. If you know a good one – tell us about it in the comment section below. And if you’ve had your own experience with UFOs or extraterrestrials – feel free to open up here on WhooNEW. As Agent Mulder would say – We want to believe! Like WhooNEW on Facebook so our stories show up in your newsfeed. Better yet – get every new story delivered to your inbox for free. Just enter your email under Scoots the Owl in the top right of this page to subscribe! Well, there is a good 3 hour audio interview of Sherry Wilde (South West Wisconsin) on VeritasRadio.com, dated June 26, 2014. But unfortunately you have to be a subscriber to hear any part of it. The other interview of her on Youtube is pretty crummy. I wouldn’t even recommend that one, sorry. My family lived in Fort Atkinson from 1959 to 1962 (southern Wisconsin). My twin brother and I have no memories of seeing crafts, but of floating down the stairs. He remembers the gray at the bottom of the stair (a recent admission after a few drinks at a wedding) but I just remember floating and a sublimely beautiful blue light. On another occasion we shared a room because we had the measles. Something rushed into the room right at me. I heard a strange springing sound, then hissing. We both later decided it was the ugly antique lamp by the door (screen memory). Suddenly I began levitating to the ceiling. My brother screamed and ran over, grabbing my leg but missing it.After that it goes black. But we were very excited talking about it the next day. I was obsessed/terrified of Casper the Ghost! and also Alvin and the Chipmunks strange voices. For a week after my left nostril burned and bled as did my navel. I remember constantly playing with a BBC-shaped object. When I read “Communion” I screamed when Whitle Strieber described the robot with the hat that flew into his room. That is really what I saw that night! I have suffered with UFO/visitor fears and obsessions my whole life. My father, mother, two sisters, and both brothers have heard and seen strange things. One sister in particular experienced a full-on conscious abduction DURING SURGERY. She knew little to nothing of the visitors yet described tall grays exactly right, down to hooded robes, huge black eyes, clawed fingers, and a taller “doctor.” She said the operating room rotated to the left and became rounded with strange muted light, tables and instruments. The aliens made a strange clicking sound, which I have often read about. She has seen several impressive UFOs. My oldest sister, as a child, went to the kitchen late one night, and saw a craft on the ground. There was a being next to it who pointed a “Ray gun” at her. At this point, her memory ends. There are many other stories. I’m writing only because I believe they are back in my life because I am reading too much about them. Wow, that sounds like a crazy experience! Thank you for sharing your story! My grandparents had a farm just outside of Neenah in the ‘70s (that’s when I was there anyway) into to the early 80s. One night I was visiting their farm when I was 9 years old. My Mother, brother and grandparents drove to town to go pizza hut, leaving me behind with my Aunt. We were sitting on the porch having a baked apple, when suddenly two egg shaped crafts appeared over the barn. They were circling around each other in silence as the floated there…my aunt got very scared and told me to “get in the house”…she then instructed me to hide under the kitchen table. I can clearly remember seeing the table legs, my brother waving from the back window of the car as he and my Mom went to town, as well as the two eggs that were floating only a couple hundred feet away, though I cannot remember anything after being under the table, except for a reoccurring nightmare of Mr. Yuck floating down the street and everything starting on fire as he passed. I can recall talking to my grandfather about it many years later, and he explained that it was just “the airport lights”…which everyone should know that there is only one light coming from the tower at a time, not two at once, much less just stopping in midair enough to look solid and certainly not circling each other! (plus, there was, as it turns out, no airport anywhere in the vicinity) I’ve dreamed very vividly of UFO/visitors all my since…I told my mother of my reoccurring visitation dreams and the crafts I had seen…she told me that she had seen those very same crafts when she was about my age at the time, and that her family even had once found her a couple of miles away from the farm naked in a field! I’ve not told many people this, but I was compelled to write after reading another post about the reoccurring dreams. there is a bunch of strange things and ufos i have seen in vernon county aswell! I want to know if any has heard of the portal in ananton and dead zones. Circles in the woods or places were nothing grows weird? I was born in Townsend, Wi. in Oconto County. They started abducting me at a very young age, the little grey’s. They said there were only 4000 of their kind left, basically they wanted my ovum. I told them do what you needs must do. So when I hit that certain age they came and harvested so to speak. They have done testing, but they aren’t the only ones! I guess I didn’t realize it was going to be a come one, come all experience. Yeah, all different kind’s of testing. I guess they realized that if you breed with another species of man you better try to understand what makes them tick! After all, people, they don’t need to use a door or window, they use a matter manipulator, they can open a doorway through your roof or wall, and a beam of light or a particle light it pulls and elevates. Well, a few year’s ago my alien doc retired, and somehow I got invited to this bash, was told he was honored that I was there. Met the doc who was taking his place. Only a partial memory of that incident! A different time there was an oxygenated water experiment, another time they took a chunk of flesh from my left thigh for DNA purposes, proof that they are and that I am! I am sure that there are many different races out there, I told them so that I wouldn’t be overwhelmed maybe they should every now and then show me a different race of being’s. And they have. Yep, I am an abductee, but not a victim. I love all forms, races, being’s. I guess maybe you guy’s may be ready to learn that not only is God real, but some of us are the alien’s decendant’s. I think they may be worried about you, and what you are doing to your world. Stop trying to just focus on yourselves, check out the big picture, we are killing our world and each other. Our world is going through death pain’s. The bee’s told me they were leaving in 1997. How do you approach people who refuse to listen and insist you are mentally off. Well, I could have told you about the flooding of our world, the poison’s in the fresh and salt water making it toxic…I have been shown many thing’s over the year’s, people from the past and futuristic event’s…People just don’t care, they like their tidy little world’s and have become a country of sheeple’s…Being manipulated by your insane, power hungry government, who don’t even give a rat’s backside about you or your children’s welfare, using your military against you! End of day’s here we are. No way are they here for any other purpose than for their own ends and benefit..- many people have been reduced to total wrecks or suffered horrendous injury and pain for a lifetime because of these visitors – then there`s the killing and harvesting of parts -…no way should this been seen as some kind of joyous experience. Thank you for posting. I wish everyone could see. In 1976 in Pennsylvania. We were taking care of my uncles animals at his farm. We lived right down the dirt road going home one night. A ufo was right above our car it had lights all around it Our car went off the road bc my mom opened the door to look up and my dad was looking up I remember the door getting stuck and everyone screaming I was about 9 Or 10. My parents talk about it a lot I try not to bc people think your crazy but it did happen I remember driving didn’t the dirt road when we got closer to our house and the outside light it took off really fast to the right. Crazy. consider yourself lucky .. that is an awesome sounding experience & very believable! 0n nov. 9th 1975 at 9:30 – 10:00 p.m. myself & a friend were cutting thru a field in beloit wi, east of krueger haskell golf course to meet a 3rd friend when we noticed two disk shaped objects about 1/4 to 1/2 mile away and 500 to 1000 feet in altitude one behind the other with the rear one a little higher. they had vertical rectangular amber lights rotating counter clockwise in sequence like the rear turn signal on a 68 mercury cougar. we stood transfixed as they moved silently & quickly in a south easterly direction across the rock river flying over the fairbanks morse engine div. foundry before disappearing low over the horizon. it all took 20 or 30 seconds but seemed like slow motion. it left us wanting a better look & hoping they would reappear. our friend never showed & was skeptical when we saw him the following day saying it was probably just an airplane. sorry but this was no plane. i hadnt seen anything like it before or since. that is something you NEVER forget. Even this blog is making fun of things many people have seen – the reference to “have they been drinking too much” or words to that effect – the reality is that people do NOT hallucinate after drinking and getting drunk and the reports of what people see are exactly that,what that have seen…people don`t make up stories that get them ridiculed – so a bit of humility from you would be a better starting point than merely making fun of them. Does anyone know of any sightings or events that happened near Carter or Cater Wisconsin sometime between 1925 and 1940. Or near Brook Farm? My mother had some sort of experience but never gave any details. She died back in 1976 of cancer and was born in Madison, Wisconsin around 1925. I recently found out about her fascination with UFO’s from my older brother.